Sick with Bronchitis and Laryngitis, this is the first wine I had in over 2 weeks. Thanks to wonderful antibiotics, I’m left with an upset stomach. This Denver versus New England AFC Championship game is going to set me back. Peyton has called “OMAHA” over 8 times before the half and I swear it seems like the players go into warp drive when they hear “OMAHA”. The score is Patriots-3 and Denver-13. I’ve always been a fan of Peyton and recognize he is a great quarterback; ten times better than his brother. However, I love me some Brady. Goodness, I need to relax; palms are sweaty and feeling anxious. I’m contemplating drinking on an upset stomach. 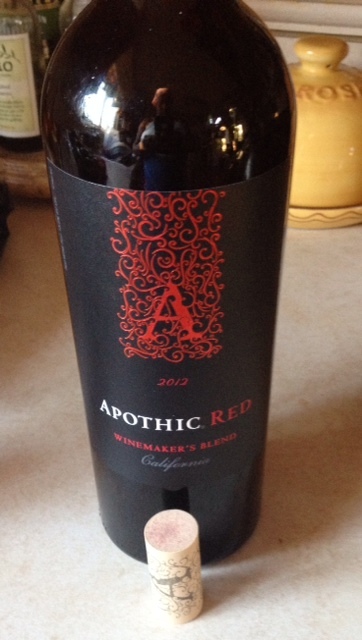 Since the Apothic Dark left an impressionable mark, I picked up a bottle of 2012 Apothic Red, Winemakers Blend from my favorite grocery store, Harris Teeter:). I’m not the only one yelling, this wine is screaming “DRINK ME!” Let’s get on with the review: thin-light texture with BIG “grapey” aromas with hint of spice and fresh vegetable. Oh my, juicy! An explosion of blackberry! I’m picking up a spice (not pepper) and cocoa powder. Imagine placing a spoonful of cocoa powder in your mouth. 2012 Apothic Red, Winemakers Blend is a complex, fruit-forward and full-bodied red wine; a blend of Zinfandel, Syrah, Cabernet Sauvignon and Merlot. Apothic has done it again! DELICIOUS! A MUST BUY! Remember to buy in batches of 3: bottle 1 – sip now, bottle 2 – brag to a friend and bottle 3 – lay down. A great method to creating a cellar and you will save money on your next purchase; you only have to buy 2 bottles:). For more information on Apothic wines, visit http://www.apothic.com and check out my review on Apothic Dark.